This report covers the period of September 18-29 as I traveled to Sweden, Denmark, and Norway for a speaking tour. The trip was organized by GN board member Agneta Norberg and Barbara Bradefors from Sweden who belong to Women for Peace. My first stop was in Malmo, Sweden for the European Social Forum where I spoke at an event on the militarization of space. Also included were GN chairperson Dave Webb (CND, England), Jan Tamas (No to Bases Campaign, Czech Republic) as well as Agneta who highlighted the growing efforts of Scandinavian aerospace corporations to join the space militarization program. Just prior to my leaving home, I did two email interviews with peace publications that produced full-page spreads that were distributed in Malmo. 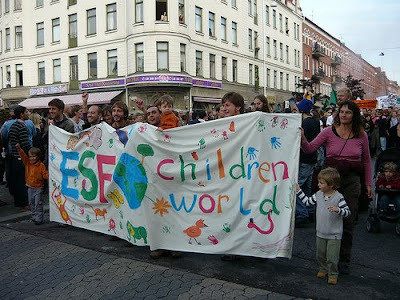 Hundreds of workshops were spread out all over Malmo during the Social Forum. The only other one I was able to attend was an excellent forum on the growing dangers of an expanding NATO which has become a global offensive military alliance under the control of the U.S. and trying to substitute itself for the United Nations. The U.S. is now pressuring NATO members to increase their military spending and to buy their weapons primarily from American weapons corporations. The head of NATO's expansion committee, Bruce Jackson, is a former Lockheed Martin executive. NATO is increasingly dominating the European Union's foreign policy and has begun expanding operations into the Asian-Pacific by holding military maneuvers with Japan, South Korea, and Australia. NATO is the cornerstone of military globalization just as the G8 is the cornerstone of economic globalization. Plans are now underway for major protests in Europe in early 2009 as part of the 60th "anniversary" of NATO. NATO is pushing the spread of "missile defense" throughout Europe. On September 19, as we made our way back to the hotel in Malmo, we ran into a massive police presence and discovered that a group of about 150 anarchists had taken over a street and were holding banners and chanting. A bank sat on one corner and police closed down all the adjoining streets. We began to mill about among the anarchists and one videographer recognized me and began to interview me. Just in that moment a couple of the black-clad youth threw something breaking the bank windows and the video team ran off to film the action. The police made it hard for people to leave the area but we found a side street and moved on. I asked Agneta what we should do about the anarchists and she responded with a question of her own, "Should we give up the streets?" Agneta arranged for me to speak at the rally that preceded the march through Malmo by 10,000 people on September 20. I was the last speaker and was given two minutes; I long ago learned to say what needs to be said in that short period of time. The march was a wonderful spirit-filled 3 1/2 hour parade through heavily populated neighborhoods full of four-story apartment buildings with people hanging out their windows. At one point we saw a heavier than usual riot squad presence along the march route and discovered that they were protecting a McDonald's hamburger joint. Just across the street sat an unprotected Burger King, and it was obvious that since "anti-globalization" protests for years have targeted McDonald's, the cops were taking no chances. Nothing happened. Comparing the massive crowd of 10,000 with the small anarchist protest the night before made clear to me that in the end, the public saw for themselves that the vast majority of people attending the Social Forum were serious and determined non-violent activists. I agree with Agneta that we can't give up the streets but we must also begin to organize local dialogues with the anarchist community about their actions, which I believe are often infiltrated with government agents who intend to disrupt them with violence in order to turn the public away from our message. During the march I had the pleasure to get to know Andre Brochu who was born in Farmington, Maine and moved to Sweden as a Vietnam War resister. Today Andre is a school librarian and a kinder, gentler man has never been found. He made sure that our small group of space-niks were well fed and watered and then escorted us back to our hotel in Malmo at the end of a long day. My next stop was Copenhagen, Denmark where I spoke at a bookstore and did an extensive interview with the nationwide Daily Worker newspaper. I also did a video interview with a Humanist movement organizer that he immediately spread worldwide via the Internet. Annelise Ebee, the president of International WILPF, took care to walk me around the city that day and I was highly impressed by the tremendous number of bicycles on the street. On September 23, Agneta and I flew to Stockholm, Sweden where I spoke that evening. The next day we both flew to Kiruna in the north of Sweden, just above the Arctic Circle. Kiruna is a mining town where iron ore is extracted and we learned that a good portion of the community's buildings, including a magnificent city hall, will soon be moved so that the mines can be expanded. Kiruna is also the location of Esrange, the rocket launching and satellite tracking spaceport facility that is connected to the European Space Agency (ESA). Here, much to my delight, I spoke to 60 students and 15 community members in an evening program. The students attend the "space high school," and are recruited from all over Sweden for the very competitive program that appears to be a training vehicle for the space industry. I was astounded at the positive and attentive reception they gave me. Afterward, many of the students talked with Agneta and I about their shock of learning about plans for the nuclearization and weaponization of space. The staff of the school invited me to come back for an extended period of time to "work with the students" and I was energized by the offer, though I wonder how we could afford to send me on such a return trip. It was one of the most exciting talks I have done in my 25 years of working on space issues. I will always remember the bright wide-eyes in the audience. They touched my heart and I just know that some good things will come from that evening. The next day Agneta and I were taken for a tour of Esrange. There we learned that the space facility is expanding its operation to serve as a tracking station for the ESA's reconnaissance and surveillance satellite system called Galileo that comes on-line in 2013 with 30 satellites. The GPS-like system will be "dual use", meaning it will serve military and civilian purposes, and will also have tracking stations near-by in Norway. On September 25 we flew back to Stockholm and Agneta took me to a Turkish family's house for dinner. We were treated to a wonderful meal, and I heard the horrible story of the military coups in Turkey during the 1970-80's. Many progressive activists were forced to flee the country as thousands were killed by their fascist government with the full support of the U.S. military and NATO. Our host described how the Turkish Social Democrats sat back and watched as their hope for real democracy was crushed by the para-military Grey Wolf dead squads used by the dictatorship to do much of the killing of those from the left who were protesting in the streets. There are quite a number of Turkish refugees in Sweden and Agneta, who is 70 years old, has befriended many of them. She has gone to Turkey several times and witnessed entire towns that were wiped out just for having stood against the military government. When I asked our host to reflect on what more they could have done at the time, he said the people did not fight back hard enough. It's advice we could use today as we see democracy slip away from us in the U.S. Our host was a journalist for a well-respected Turkish political publication and interviewed me about space issues before we said good-night. September 26 found us flying to Oslo, Norway where I was hosted by WILPF for a well-attended talk. Alongside me at the podium was a Norwegian journalist who has written extensively about Norway's growing role in space issues due to their membership in NATO and the presence of a U.S. Star Wars radar base in Vardo, just a few miles from the Russian border. Vardo collects intelligence data on Russia's long-range ballistic missiles. Coupled with the new U.S. radar proposed for the Czech Republic, this iinformation would give the Pentagon a formidable military advantage in developing a first-strike capability against Russia. Norway also hosts a National Security Agency (NSA) surveillance station at Fauske and has a rocket launch range called Andoya. Our last two days in Oslo were spent being superbly hosted by WILPF members Edel Beukes, Dr. Dagmar Sorboe, and Inya L'Orange. These three powerful women came to our GN annual meeting in Darmstadt, Germany a couple of years ago and have determined that they will weave the cost of space technology and conversion of the global war machine into discussions at upcoming international global climate change meetings. They also pledged to work to expand discussions of Norway's role in space militarization. My hosts kept talking about the "oil dope" that the Norwegian people are addicted to as their off-shore oil drilling industry has done much to strengthen their economy as prices for the fossil fuel skyrocket. On my first day off during the trip, September 26, Inya took Agneta and me for a 6-7 mile walk along the beautiful hills and lakes overlooking Oslo. The next day Dagmar took the four of us for a boat trip in the fjord where she showed us some ruins from the WW II Nazi occupation. Like all military occupations, this one could not last, and I was once again reminded that the U.S. empire will in time also crumble. Empire is a contradiction and violates the laws of nature. I took a good number of copies of our new documentary video "A Space 4 Peace" with me on the trip and they sold very quickly. By the end of the tour we were having to ask people to copy them and pass them on to others. People were hungry for a good teaching vehicle and the video surely is a good one. During this trip to Scandinavia I heard over and over again about current efforts to slowly but steadily dismantle the social welfare system for which these three countries are so well known. Just like everywhere else, the ethic of privatization is being preached and cutbacks in social programs are now underway. Sweden, Denmark, and Norway are still far ahead of most countries in the human services they still provide, but corporate globalization is hitting this region too. Militarization is steadily creeping into the Nordic lands and people there are worried about NATO expansion and possible war with their close neighbor Russia. Throughout the era of the cold war between the U.S. and the former Soviet Union, most of the women I met on this trip had been key leaders in the effort to end the nuclear arms race between the two superpowers and to build human relationships between their own country and the people of Russia. Once again, by necessity, they are being drawn into rebuilding the peaceful bridge which this time has a new and deadly twist - the militarization and weaponization of space. I thank Agneta Norberg, Barbara Bradefors, and all the many others who worked hard to make this trip such a wonderful experience. I am sure we will work together again. It was nice that you wrote about Kiruna. We appreciated your lecture very much, and we hope you’ll come back again some day. You left me depressed and inspired. Thinking right now of what's the best way to make a different. Thank you for visiting us and please come back some time! Girls....thanks so much for your comments. It warms my heart to know you are keeping your eyes open and staying close. At first comes shock, then some depression because we have had the wool pulled over our eyes, then comes desire to do something, and then comes passion to make it happen. So keep breathing and moving and you will find your paths.